E*Trade is running a clever teaser advertisement on MySpace today. The 200 x 175 pixel ad in the right-middle area of the user's homepage asks, "Are you willing to accept a $1.50 fee to see this ad?" (click on the inset right for a closer view). Choosing "yes" results in another screen saying, "Are you sure?" while selecting "no" yields a "Good." 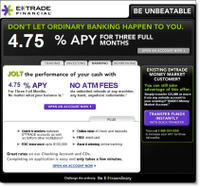 Either way, a pitch for E*Trade's ATM rebate program is the final screen (click on inset left for a closeup). Users clicking through end up on the landing page shown below. Although it took me a moment to figure out the premise, that a $1.50 fee to view an ad is as absurd as paying that to use an ATM, it's a clever campaign. The company is sure to get good click-throughs, at least on the teaser ad. Whether the company signs up enough good checking accounts is another matter. But if you are courting young online users, you must take a look at MySpace (see FMW March 16).